Alan Mathison Turing (June 23, 1912 – June 7, 1954) was an English mathematician, logician, cryptographer and one of the originators of modern computer science. In 1936, Turing developed the concept of “Turing machines,” theoretical devices that could mechanically perform mathematical computations by following a specific table of instructions. Turing machines formalized the concept of the algorithm and helped to determine the limits of computability in mathematical functions (Church–Turing thesis). The concept of a “universal Turing machine” which could incorporate the functions of numerous lesser Turing machines laid the groundwork for computer programming. 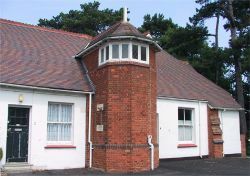 During World War II, Turing worked at Bletchley Park, Britain's codebreaking center, and was for a time head of Hut 8, the section responsible for German naval cryptanalysis. He devised a number of techniques for breaking German ciphers, including the “bombe,” an electromechanical machine that could detect the settings for the German “Enigma” code machine. In 1950, Turing published an article, "Computing Machinery and Intelligence" (Mind, October 1950), proposing that it was possible for a computer to simulate all the processes of human intelligence, and suggesting the “Turing test” to determine the intelligence of a machine. He worked at the National Physical Laboratory in England, creating one of the first designs for a stored-program computer, although it was never actually built. In 1947 he moved to the University of Manchester to work on software for the Manchester Mark I, one of the world's earliest true computers. Turing was conceived in 1911 in Chatrapur, India. His father, Julius Mathison Turing, was a member of the Indian civil service. Julius and his wife Sara (née Stoney) wanted Alan to be brought up in England, so they returned to Maida Vale, London, where Turing was born June 23, 1912, as recorded by a blue plaque on the outside of the building, now the Colonnade Hotel. His father's civil service commission was still active, and during Turing's childhood his parents traveled between Guildford, England and India, leaving their two sons to stay with friends in England, rather than risk their health in the British colony. Very early in life, Turing showed signs of the genius he was to display more prominently later. He is said to have taught himself to read in three weeks, and to have shown an early affinity for numbers and puzzles. His parents enrolled him at St. Michael's, a day school, at the age of six. The headmistress recognized his genius immediately, as did many of his subsequent educators. In 1926, at the age of 14, he went on to Sherborne School in Dorset. His first day of term coincided with a transportation strike in England; he was so determined to attend his first day at Sherborne that he rode his bike unaccompanied more than sixty miles from Southampton to the school, stopping overnight at an inn and making headlines in the local press. Turing's natural inclination toward mathematics and science did not earn him the respect of his teachers at Sherborne, a famous and expensive British public school, whose concept of education placed more emphasis on the classics than on science. His headmaster wrote to his parents: "I hope he will not fall between two schools. If he is to stay at public school, he must aim at becoming educated. If he is to be solely a Scientific Specialist, he is wasting his time at a public school." Turing continued to show remarkable ability in the studies he loved, solving advanced problems in 1927 without having even studied elementary calculus. In 1928, at the age of sixteen, Turing encountered Albert Einstein's work; not only did he grasp it, but he extrapolated Einstein's questioning of Isaac Newton's laws of motion from a text in which this was never made explicit. Turing was encouraged at school by a friend, Christopher Morcom, who unfortunately died suddenly only a few weeks into their last term at Sherborne, from complications of bovine tuberculosis. 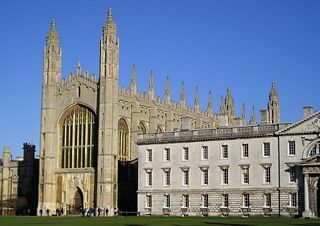 Turing failed to win a scholarship to Trinity College, Cambridge, because he was unwilling to work as hard on his classical studies as on science and mathematics. Instead he became an undergraduate at the college of his second choice, King's College, Cambridge from 1931 to 1934, graduating with a distinguished degree, and in 1935 was elected a fellow at King's on the strength of a dissertation on the Gaussian error function. In his momentous paper "On Computable Numbers, with an Application to the Entscheidungsproblem" (submitted on May 28, 1936), Turing proposed what are now called “Turing machines,” formal and simple devices which could perform any conceivable mathematical function if it were representable as an algorithm (Turing machines are still the central object of study in theory of computation). He went on to prove that there was no solution to the Entscheidungsproblem by showing that it is not possible to decide algorithmically whether a given Turing machine will ever halt. While his proof was published subsequent to Alonzo Church's equivalent proof in respect to his lambda calculus, Turing's work was considerably more accessible and intuitive. Turing spent most of 1937 and 1938 at Princeton University, studying under Alonzo Church. In 1938 he obtained his Ph.D. from Princeton; his dissertation introduced the notion of relative computing, in which Turing machines are augmented with so-called "oracles," functions that perform operations outside of the machine, such as intuitive judgments made by a human mathematician, allowing a study of problems that cannot be solved by a Turing machine. Back in Cambridge in 1939, Turing attended lectures by Ludwig Wittgenstein about the foundations of mathematics. The two argued and disagreed, with Turing defending formalism, and Wittgenstein arguing that mathematics is overvalued and does not discover any absolute truths. During World War II, Turing was an important participant in the British efforts at Bletchley Park to break German ciphers. Building on cryptanalysis work carried out in Poland before the war, he contributed several insights into breaking both the German Enigma machine and the Lorenz SZ 40/42 (a teletype cipher attachment codenamed "Tunny" by the British), and was, for a time, head of Hut 8, the section responsible for reading German naval signals. Since September 1938, Turing had been working part-time for the Government Code and Cypher School (GCCS), the British codebreaking organization. He worked on the problem of the German “Enigma” machine, and collaborated with Dilly Knox, a senior GCCS codebreaker. On September 4, 1939, the day after Britain declared war on Germany, Turing reported to Bletchley Park, the wartime station of GCCS. Within weeks of arriving at Bletchley Park, Turing had devised an electromechanical machine which could help break Enigma: the bombe, named after the Polish-designed bomba. The bombe, with an enhancement suggested by mathematician Gordon Welchman, became the primary tool used to read Enigma traffic. The bombe searched for the correct settings of the Enigma rotors, and required a suitable "crib," a piece of matching plaintext and ciphertext. For each possible setting of the rotors, the bombe performed a chain of logical deductions based on the crib, implemented electrically. The bombe detected when a contradiction had occurred, and ruled out that setting, moving onto the next. Most of the possible settings would cause contradictions and be discarded, leaving only a few to be investigated in detail. 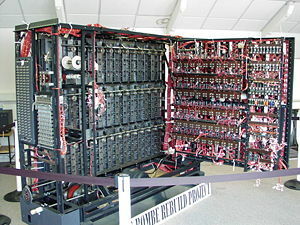 Turing's first bombe was installed on March 18, 1940. By the end of the war, over two hundred bombes were in operation. In December 1940, Turing solved the naval Enigma indicator system, which was more complex than the indicator systems used by the other services. Turing also invented a Bayesian statistical technique termed "Banburismus" to assist in breaking Naval Enigma. Banburismus could rule out certain orders of the Enigma rotors, reducing time needed to test settings on the bombes. In the spring of 1941, Turing proposed marriage to a Hut 8 coworker, Joan Clarke, but the engagement was broken off by mutual agreement during the summer. In July 1942, Turing devised a technique termed Turingismus or Turingery for use against the "Fish" Lorenz cipher. He also introduced the Fish team to Tommy Flowers, who went on to design the Colossus computer. It is a frequent misconception that Turing was a key figure in the design of Colossus; this was not the case. In November 1942, Turing traveled to the United States and worked with U.S. Navy cryptanalysts on Naval Enigma and bombe construction in Washington, D.C., and assisted at Bell Labs with the development of secure speech devices. He returned to Bletchley Park in March 1943. During his absence, Conel Hugh O'Donel Alexander had officially assumed the position of head of Hut 8. Alexander had been de facto head for some time, Turing having little interest in the day-to-day running of the section. Turing became a general consultant for cryptanalysis at Bletchley Park. In the latter part of the war, teaching himself electronics at the same time, Turing undertook (assisted by engineer Donald Bayley) the design of a portable machine codenamed Delilah to allow secure voice communications. Intended for different applications, Delilah lacked capability for use with long-distance radio transmissions, and was completed too late to be used in the war. Though Turing demonstrated it to officials by encrypting/decrypting a recording of a speech by Winston Churchill, Delilah was not adopted for use by the military. Turing achieved world-class marathon standards of his era. His best time of 2 hours, 46 minutes, 3 seconds, was only 11 minutes slower than the winner in the 1948 Summer Olympics. From 1945 to 1947 Turing was at the National Physical Laboratory, where he worked on the design of the Automatic Computing Engine (ACE). In a paper given on February 19, 1946, he presented the first complete design of a stored-program computer in Britain. Although he succeeded in designing the ACE, there were delays in starting the project and Turing became disillusioned. In late 1947, he returned to Cambridge for a sabbatical year. While he was at Cambridge, ACE was completed in his absence and executed its first program on May 10, 1950. 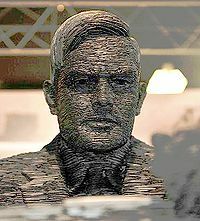 In 1949 Turing became deputy director of the computing laboratory at University of Manchester, and worked on software for one of the earliest true computers, the Manchester Mark I. During this time he continued to do more abstract work, and in "Computing Machinery and Intelligence" (Mind, October 1950), Turing addressed the problem of artificial intelligence, and proposed an experiment now known as the Turing test, an attempt to define a standard by which a machine could be called "sentient." In 1948, Turing, working with his former undergraduate colleague, D. G. Champernowne, began writing a chess program for a computer that did not yet exist. In 1952, lacking a computer powerful enough to execute the program, Turing played a game in which he simulated the computer, taking about half an hour per move. The game was recorded; the program lost to Turing's colleague Alick Glennie, although it is said that it won a game against Champernowne's wife. From 1952 until his death in 1954, Turing worked on mathematical biology, specifically morphogenesis. He published a paper on the subject called "The Chemical Basis of Morphogenesis" in 1952, putting forth the Turing hypothesis of pattern formation.His central interest in the field was understanding Fibonacci phyllotaxis, the existence of Fibonacci numbers in plant structures. He used reaction-diffusion equations which are now central to the field of pattern formation. Later papers went unpublished until 1992 when Collected Works of A.M. Turing was published. Turing was a homosexual during a period when homosexual acts were illegal in England and homosexuality was regarded as a mental illness. In 1952, Arnold Murray, a 19-year-old recent acquaintance of his helped an accomplice to break into Turing's house, and Turing went to the police to report the crime. As a result of the police investigation, Turing acknowledged a relationship with Murray, and they were charged with gross indecency under Section 11 of the Criminal Law Amendment Act of 1885. Turing was unrepentant and was convicted. He was given a choice between imprisonment or undergoing hormonal treatment. In order to avoid going to jail, he accepted the estrogen hormone injections, which lasted for a year, with side effects including the development of breasts. His conviction led to a removal of his security clearance and prevented him from continuing consultancy for General Command Headquarters on cryptographic matters. In 1954, Turing died of cyanide poisoning at the age of 41, apparently from a cyanide-laced apple found half-eaten by his bedside. The apple itself was never tested for contamination with cyanide, and cyanide poisoning as a cause of death was established by a post-mortem. Most believe that his death was intentional, and the death was ruled a suicide, but his mother insisted that the ingestion an accident due to his careless storage of laboratory chemicals. The possibility of assassination has also been suggested; at that time Turing's homosexuality would have been perceived as a security risk. Since 1966, the Turing Award has been given annually by the Association for Computing Machinery to a person for technical contributions to the computing community. Various tributes to Turing have been made in Manchester, the city where he worked towards the end of his life. 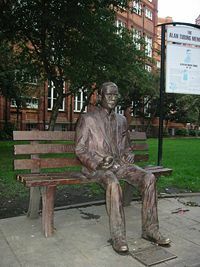 In 1994 a stretch of the Manchester city inner ring road was named Alan Turing Way and a statue of Turing was unveiled in Manchester on June 23, 2001 in Sackville Park. A celebration of Turing's life and achievements arranged by the British Logic Colloquium and the British Society for the History of Mathematics was held on June 5, 2004, at the University of Manchester, and the Alan Turing Institute was initiated in the university that summer. On June 23, 1998, on what would have been Turing's 86th birthday, Andrew Hodges, his biographer, unveiled an official English Heritage Blue Plaque on his childhood home in Warrington Crescent, London, now the Colonnade Hotel. To mark the fiftieth anniversary of his death, a memorial plaque was unveiled on June 7, 2004, at his former residence, Hollymeade, in Wilmslow. Various universities have honored Alan Turing for his achievements in computing. On October 28, 2004, a bronze statue of Alan Turing sculpted by John W. Mills was unveiled at the University of Surrey  The statue marking the fiftieth anniversary of Turing's death, portrays Turing carrying his books across the campus. The Polytechnic University of Puerto Rico and Los Andes University of Bogotá, Colombia, both have computer laboratories named after Turing. The University of Texas at Austin has an honors computer science program named the Turing Scholars. Carnegie Mellon University has a granite bench, situated in The Hornbostel Mall, with the name "Alan Turing" carved across the top, "Read" down the left leg, and "Write" down the other. In 2009, after receiving a petition with over 30,000 signatures, British Prime Minister Gordon Brown made an official public apology on behalf of the British government for "the appalling way he was treated." In December 2013, Queen Elizabeth II granted Turing a posthumous pardon for his conviction for gross indecency. The Queen officially pronounced Turing pardoned in August 2014. Turing was a pioneer in the field of computer science and artificial intelligence. His initial work on mathematical logic developed ways in which the mathematical calculations made by the human mind using logic, could be carried out as self-generating mechanical processes independent of the human mind. His early work was concerned with cataloging infallible logical processes and recognizing the limitations of such computations. During World War II, Turing became involved in working on encryption and decoding for the military, and many scholars consider this work to have been a distraction from his work in logic and mathematics. However, it was while working on the problems of decoding encrypted German messages that Turing built his first real computing “machines,” incorporating logical processes to sort through vast amounts of information and identify possible solutions for the human code breakers. He also realized the potential of using electrical circuits to store and mechanically process data according to written instructions. After World War II, Turing became involved in writing some of the first computer software programs, even before computers were built. Beyond this, however, he conceived of the idea that all the thinking processes of the human brain could possibly be duplicated using some form of logical process. While considering whether a machine could be constructed to play chess, he came to included the possibility of making errors as part of his concept of intelligence; a truly intelligent being is not an infallible being, but one that makes errors, recognizes them and then “learns” from the experience. Turing’s major contribution to science and philosophy was his treatment of symbolic logic as a new branch of applied mathematics, opening it up to physical and engineering applications. Turing’s preference for working independently and in isolation enabled him to see logic from a unique perspective and to synthesize mathematical logic and the philosophy of mind. He said that he took on the challenge of solving the difficult German U-Boat Enigma code because no one else wanted to attempt it, and he was able to work on it by himself. As a result of his isolation, however, many of his ideas were not promulgated until later—for example, in the textbooks of Davis (1958) and Minsky (1967). Certain concepts developed by Turing still remain central to the development of computer science and artificial intelligence. In his momentous paper "On Computable Numbers, with an Application to the Entscheidungsproblem" (submitted on May 28, 1936), Turing reformulated Kurt Gödel's 1931 results on the limits of proof and computation, substituting Gödel's universal arithmetic-based formal language with what are now called “Turing machines,” formal and simple logical devices. Turing developed the concept of his "machines" in response to the lectures of the topologist M. H. A. (Max) Newman, which discussed Gödel's 1931 proof of the formal incompleteness of logical systems rich enough to include arithmetic, and Hilbert’s "Entscheidungsproblem" (decision problem). The problem was whether there existed some universal method which could be used to determine that any given mathematical proposition was provable or not. The term “mechanical” had often been used to characterize the formal way in which Hilbert approached the problem, and Turing adapted the concept of a “machine” which could perform mathematical calculations. Turing “machines” were theoretical devices which broke down mathematical calculations into simple atomic units. Though the machines did not exist in physical reality, they could be feasibly be constructed on the model of a teleprinter, with an infinite paper tape that could move through it backwards or forwards, and a ‘head’ that could read, erase and print new symbols. The tape was divided into squares, one next to the other, which could each contain one of a finite alphabet of symbols. The machine operated according to a finite table, or set, of instructions. The machine would scan one square of the tape at a time, and, according to the symbol in that square, perform one of the instructions in the table: print or erase a symbol on the scanned square or move forward or backward to scan the adjacent square. A “state register” would document the state of the Turing machine at each step. The number of different possible states was always finite, and there was one special start state by which the state register was initialized. Every part of the machine; its alphabet of symbols, its table of instructions, its number of possible states, and its actions of printing, erasing and moving forward or backward were finite, discrete and distinguishable. Only the potentially unlimited amount of paper tape gave the machine the possibility of carrying on its computation infinitely. No actual Turing machine would be likely to have practical applications, since using them was much slower than alternative methods of calculation. In some models the tape moves and the unused tape is truly blank. The instruction to be performed (q4) is shown over the scanned square. Drawing after Kleene (1952), p. 375. In some models the head moves along the stationary tape. The instruction to be performed (q1) is shown inside the head. In this model the "blank" tape is all 0's. The shaded squares, including the blank scanned by the head, and the squares marked 1, 1, B, and the head symbol, constitute the system state. Drawing after Minsky (1967), p. 121. Turing argued that any function which could be calculated by means of a mechanical, deterministic (algorithmic) procedure could be calculated by a Turing machine. Turing developed a thesis which stated that any function which could not be computed by a Turing machine was beyond the limitations of computing agents. In developing his machines, Turing set out to embody the most general mechanical thinking processes as carried out by a human being. A primary concern in Turing’s thought was how to relate the logical Turing machines to the physical world. The number of Turing machines was infinite, each corresponding to a different method or mathematical procedure and operating according to a different ‘table of behavior,’ the equivalent of a modern computer program. Turing postulated a “universal machine,” which would have “tables of behavior” complex enough to read the tables of other, simpler, Turing machines and incorporate their functions into its own activities. There could be an infinite number of these universal machines. The universal Turing machines anticipated the way in which modern computer software programs incorporate and relate to hundreds of simpler programs. After his wartime experiences with the construction of actual computing machines which mechanized human procedures and judgment, Turing began to develop the idea that all processes of human intelligence could be computable. He researched how machines might be made to perform functions that were not purely mechanical in nature, and to speak of simulating “initiative” as well as “discipline.” Turing’s best known paper, "Computing Machinery and Intelligence" (Mind, October 1950), his first publication in a philosophical journal, raised many of the questions which are still under discussion today in the field of artificial intelligence, such as whether computers could be made to simulate the physical operation of human neurons. Turing argued that the human brain must somehow be organized for intelligence, and that this organization must be able to be realized in some discrete mechanical form. His concept of intelligence involved the possibility of making mistakes in judgement, and also the ability to evaluate future risk and make judgments. Turing suggested ideas for systems which could modify their own programs, such as nets of logical components (‘unorganized machines’) whose properties could be ‘trained’ into a desired function. He thus predicted neural networks, and anticipated modern “genetical search” algorithms, but was not able to develop these concepts further because electronic computers were then only in the early stages of operation. At the time of his death, Turing was apparently researching the foundations of quantum mechanics, having earlier studied the theories of Arthur Eddington and John von Neumann, in an effort to further understand the physiological functions of the human brain. Turing’s brief life, his involvement in breaking the Enigma code during World War II, his anticipation of modern computer science, and his tragic death have inspired a number of biographies and literary works about him. Turing's mother, Sara Turing, who survived him by many years, wrote a biography of her son glorifying his life. Published in 1959, it could not cover his war work; scarcely three hundred copies were sold. Its six-page foreword, by Lyn Irvine, includes reminiscences and is more frequently quoted. Andrew Hodges wrote a definitive biography Alan Turing: The Enigma in 1983. The play Breaking the Code by Hugh Whitemore is about the life and death of Turing. In the original West End and Broadway runs, the role of Turing was played by Derek Jacobi, who also played Turing in a 1996 television adaptation of the play. Turing is examined in A Madman Dreams of Turing Machines by Janna Levin. David Leavitt’s The Man Who Knew Too Much: Alan Turing and the Invention of the Computer. The 2014 historical drama film The Imitation Game, directed by Morten Tyldum and starring Benedict Cumberbatch as Turing and Keira Knightley as Joan Clarke, is about Alan Turing breaking the Enigma code with other codebreakers in Bletchley Park. ↑ Andrew Hodges, Alan Turing: The Enigma (New York: Simon & Schuster, 1983, ISBN 0671492071), 5. ↑ 2.0 2.1 Andrew Hodges, The Alan Turing Internet Scrapbook, The Alan Turing Home Page. Retrieved July 27, 2007. ↑ Jack Copeland, "Colossus and the Dawning of the Computer Age," in Action This Day (2001), 352. ↑ 7.0 7.1 B. Jack Copeland (ed. ), Colossus: The Secrets of Bletchley Park's Codebreaking Computers (New York: Oxford University Press, 2006, ISBN 019284055X), 378. ↑ M. H. A. Newman, “Alan Mathison Turing,” Biographical Memoirs of Fellows of the Royal Society, vol. 1 (The Royal Society, 1955), 254. ↑ Lucy Sherriff, "Turing honoured with bronze statue," The Register (October 29, 2004). Retrieved July 27, 2007. ↑ "Athletics: Marathon and Decathlon Championships," The Times (August 25, 1947). ↑ Chessgame.com, Alan Turing vs Alick Glennie. Retrieved July 27, 2007. ↑ Max Planck Society, “Control Mechanism For Biological Pattern Formation Decoded,” ScienceDaily (November 30, 2006). Retrieved July 27, 2007. ↑ Jim Holt, “Code-Breaker: The life and death of Alan Turing,” The New Yorker (February 6, 2006). Retrieved April 17, 2007. 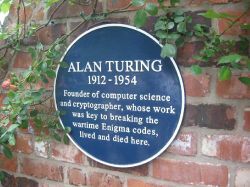 ↑ Andrew Hodges, “Unveiling the official Blue Plaque on Alan Turing's Birthplace,” Alan Turing Home Page. Retrieved July 27, 2007. ↑ Year in Review University of Surrey Annual Report 2004-2005. Retrieved March 4, 2015. ↑ Royal Pardon for Alan Turing Retrieved March 4, 2015. ↑ Oliver Wright, Alan Turing gets his royal pardon for 'gross indecency' – 61 years after he poisoned himself The Independent, December 23, 2013. Retrieved March 4, 2015. ↑ Thom Senzee, With Queen's Decree, Alan Turing Is Now Officially Pardoned Advocate.com, August 22, 2014. Retrieved March 4, 2015. ↑ Sara Turing to Lyn Newman, 1967, Library of St. John's College, Cambridge. Copeland, B. Jack. "Colossus: Its Origins and Originators." IEEE Annals of the History of Computing 26(4) (2004): 38–45. Newman, M. H. A. “Alan Mathison Turing.” Biographical Memoirs of Fellows of the Royal Society, vol. 1. The Royal Society, 1955. Wittgenstein, Ludwig. Wittgenstein's Lectures on the Foundations of Mathematics (1932–1935). Edited by Cora Diamond. Ithaca, NY: Cornell University Press, 1976. Turing, Alan M. "Computing Machinery and Intelligence," Mind 59: 433-460. Turing, Alan M. "On Computable Numbers with an Application to the Entscheidungsproblem."